As low as $87.95 per gallon! 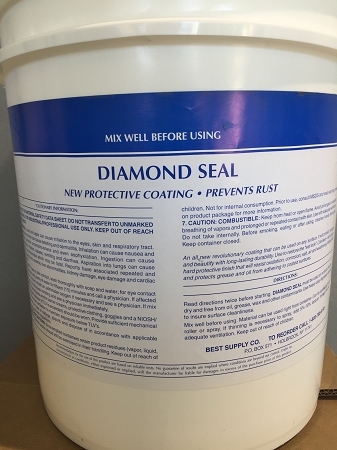 Diamond Seal Protective Coating is specially formulated to provide a tough, mar, scuff, and abrasion resistant coating for interior and exterior concrete, metal and wood surfaces. Diamond Seal Protective Coating provides a super hard, tough, durable, weather, corrosive, UV, and abrasion resistant coating that withstands repeated washing and weathering making it ideal for use on heavy traffic areas. It is designed for coating factory, heavy equipment shop or barn surfaces, storage and machinery room floors, catwalks, walkways, garages and other similar areas where a heavy duty coating is required. Diamond Seal Protective Coating is available in color or clear. Surface Preparation: Proper surface preparation is of prime importance in obtaining the maximum performance of any coating. All surfaces to be coated must be clean, dry, and free from dirt, dust, grease, wax, efflorescence, mildew, chalk, soap residue, loose paint and any foreign material. New concrete or masonry surfaces should age 30 days before being coated. Concrete that is smooth traveled or suspected of treatment with chemical “de-icers” should be etched with dilute muriatric acid and rinsed thoroughly with clean water before coating to promote bonding. Masonry and Concrete- After preparing the surfaces as stated above. Apply two coats of Diamond Seal Protective Coating. Two coats are recommended for best performance. Wood- Prepare the surfaces as stated above and apply two coats of Diamond Seal Protective Coating for optimum performance. Metal- Requires only surface preparation including the removal or conversion of any rust before coating with one or two coats of Diamond Seal Protective Coating. Use an appropriate metal primer when additional corrosion resistance is desired. Black Star Rust Converter is recommended for use as a primer and rust converter. Feel free to contact us for more information regarding Black Star Rust Converter. Prepare the surface as stated above. Any bare areas should be prepared as described for New Uncoated Surfaces and then spot prime with one coat of Diamond Seal Protective Coating. Finish with one or two additional coats. Stir thoroughly and apply without thinning by brush, roller, or spray at a rate of 400 square feet per gallon. Square foot averages may vary depending upon surface texture and porosity. 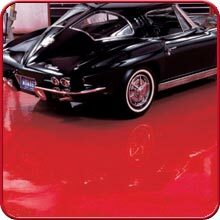 Diamond Seal Protective Coating is dry to walk on or re-coat in 24-36 hours, under normal conditions. Cool temperatures, high humidity, heavy film thickness, or poor ventilation will extend drying times. Clean up equipment immediately after use with paint thinner or mineral spirits and dry for storage. Follow solvent manufacture’s label directions for use and recommended protective equipment. Do not apply when air or surface temperature will be below 40’F within 24 hours of application or on surfaces hot from direct sun. Do not apply if rain is imminent. Do not use on unsound or crumbly surfaces in need of repair. Do not mix with water or other products.